Self-saucing puddings are one of the easiest puddings to make. They are pretty much a cake batter covered with a liquid mixture that sinks down below the cakey-top to form a sticky rich gooey sauce as it cooks. The trouble with the sticky rich gooey sauce is that it is made up of sugar, sugar and more sugar so it is very sweet. To help cut through this rich sweetness I have added fresh fruit to the pudding and reduced the sugar in both the batter and the sauce. Adding fruit adds a refreshing texture & flavour counterpoint to the sauce & cake and really, what pudding isn’t improved by adding some fruit? White chocolate cheesecake sounds great, but chuck in some raspberries or lemon and it transforms from great to really really great. Our vegetable garden is a success – the produce we are picking is the driving force of deciding what’s for tea. 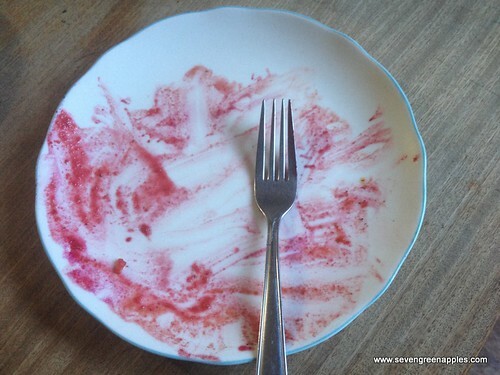 The Anster advised me to hurry up and find something to do with beetroot as they were ready. So turning to the cookbook library, a risotto sounded just the ticket. 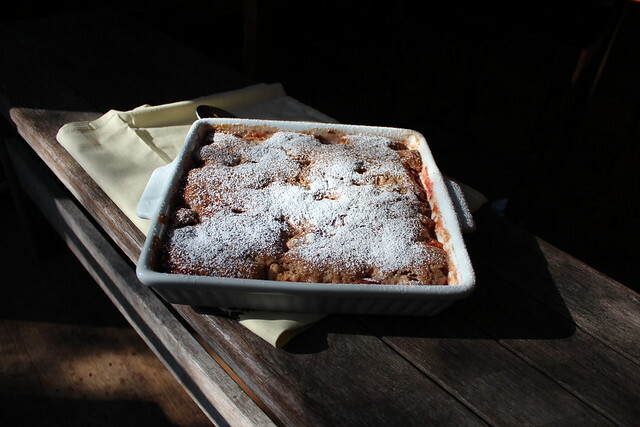 The Anster found a nice looking recipe that seemed quite easy to execute – but I took over and found a different recipe – my recipe was way better because it had apples in it. Beetroot Risotto with Baked Apples, Rocket and Balsamic Glaze sounded intriguing. The ingredient list seemed straight forward enough – I didn’t have rocket but the silverbeet was begging to be used so away I went. The recipe is a little scanty in details but that has never bothered me in the past. The beetroot was pulled, photographed, scrubbed and boiled into tender submission while I gathered the remaining ingredients. As the recipe only fed 4, and we had 6 to feed, I roughly increased it by half again. 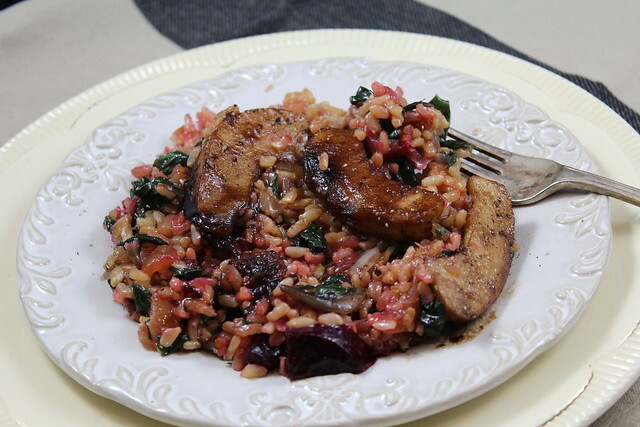 As for me – I have to agree it didn’t look as though it was going to be worth all the effort of making it but the risotto had an incredible depth of flavour. I think next time I’d parboil the rice to speed up the process. Scrub the beetroot and twist off the greenery. Snap off long roots. Cover in cold water and bring to the boil. 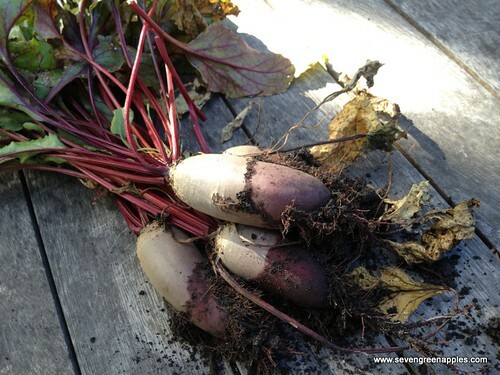 Boil until the beetroot is tender. Drain the beets (reserve the cooking liquid) and cool them a little before skinning – an easy way to do this is to pierce the top end with a fork then push the skins off with the back of a spoon or your hands if you don’t mind getting vivid pink fingers – they slip off really easy. Dice the beetroot. 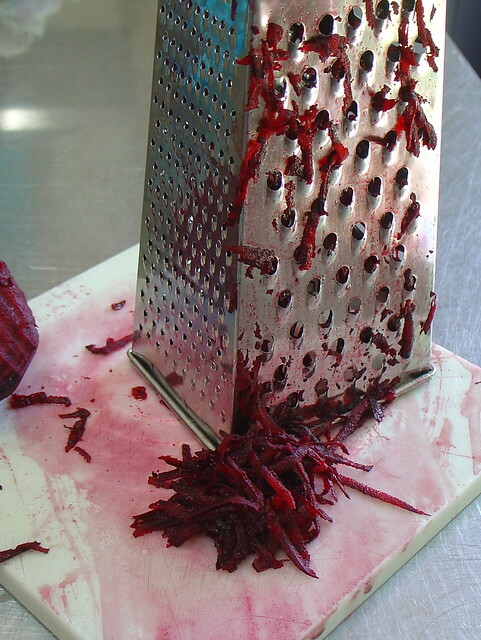 Place half the diced beetroot with half the cooking liquid in the blender and purée until smooth. Set aside for later. Peel and finely dice the onions . Prepare stock in a large pot and keep over very low heat so the stock retains its heat. Place caraway seeds into a separate small frying pan or pot and heat gently, tossing now and then, until fragrant. Tip into a mortar and pestle and crush the seeds. Heat a large frying pan (I always make our risotto in a large cast-iron electric frying pan). Add oil and butter. Once melted, chuck in the onion and rice and stir until the rice is well coated with the butter mixture. Add the seeds to the large frying pan and stir until they are mixed through the rice. Add a cup of hot stock to the rice one cup at a time to the rice, only adding more stock when the first lot has evaporated. By the time the stock is all added, the rice should nearly be done. If more liquid is needed, add the reserved beetroot juice, or hot water. The amount of liquid required depends on the type of rice used and the speed at which it cooks – I didn’t have enough brown rice so I added some medium grain red rice which takes a long time to cook but has a gorgeous nutty flavour. I used the full measure of stock, all the beetroot juice and extra hot water before the rice was cooked sufficiently. Meanwhile prepare the apples. Quarter and core the apples, then cut each quarter into about 3 slices. Cook apples – I microwaved the apples with a little water until they were tender, however they can be baked or pan-fried with a little butter. Prepare the balsamic glaze – place balsamic vinegar and apple syrup in a small pot and heat gently until the mixture is quite thick and syrupy. Cover and set aside – keeping warm until required. Wash silverbeet well then shake off any moisture. Remove stalks and discard, then slice the leaves finely. Once the rice is nearly done, add the puréed beetroot and silverbeet to the frying pan. Stir through and heat until the silverbeet is wilted. Taste the mixture and season to taste. Add the diced beetroot and stir until just combined. Plate up the risotto, then top with hot apple and drizzle with balsamic syrup.